Over the past twenty years there has been an exponential increase in the technology for acquiring and analyzing genotypic data but unfortunately this has not been in parallel with phenotyping technologies. As study populations become ever-larger, on the order of thousands of individuals, the ability to obtain precise and accurate phenotypic measurements becomes paramount. 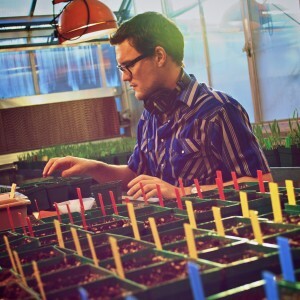 My work in the Gore lab focuses on using high-throughput phenotyping technologies for field-grown plants, specifically proximal sensing techniques, to elucidate the genetic mechanisms responsible for complex traits. Currently, I am analyzing a multi-year cotton field experiment to understand how drought and heat stress impact physiological and agronomic traits using data gathered by proximal sensing. I am also involved with the development and implementation of small unmanned aircraft systems (sUAS) for use in field-based high-throughput phenotyping. The goal of my research is to develop new phenotyping tools to aid in applied plant breeding for the development of superior plant cultivars.